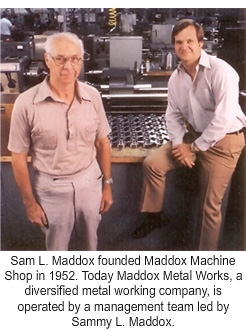 Founded in 1952 Maddox Metal Works Inc. is a precision machining, gear cutting and sheet metal fabrication company located in Dallas, Texas, USA. The company has a diverse customer base including food processing equipment, aerospace & defense (including primary parts, critical parts and flight safety parts), oil field, steel mill equipment and other industries. © 2008 Maddox Metal Works, Inc. All Rights Reserved.